My Blogger Buzz: How to Place Adsense After Read More Tag In All Posts? How to Place Adsense After Read More Tag In All Posts? Newbies have usually questioned this: how to add Google adsense in blogger below read more or jump break tag. how you can place adsense code just after <! --More--> tag in blogger blog. This one of the most effective and ethical approach to increase your adsense earnings while adding your adsense code after read more we have chances more to raise the CTR. 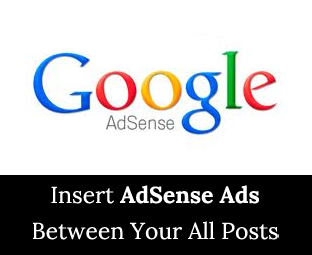 You can add adsense ads between all your blog posts at once just after read more or jump break. The middle of the post is the place where we can get maximum impressions from all the visitors. So lets see how you can add adsense just after read more tag in blogger blog. You can check this widget on our blog after this paragraph. Why to Show Adsense After Read More Tag? Even as discussed in the above para, if someone would like to boost the actual adsense earning more often than not we indicate the adsense code within the post, which will dramatically boost adsense earning. This may be easily completed in WordPress blog, because WP offers dozens of plugins to exhibit the adsense as well as any advertising and marketing banner simply and anywhere in the blog. But when it reaches in blogger then that becomes super difficult to complete the exact job. Blogspot offers less plugins compared to WP so to make the blogspot blog as Wp then we've got some alternative plugins as well as doing many serious personalization. How to Place Adsense Between Posts? First Of All, we have to install the jQuery Plugin which would display the advertisements between each post no matter whether they are old or new because the plugin works quite amazingly. Go to Blogger.com >> Your Site >> Template >> Edit HTML >> Proceed and, within the coding search for <body> Tag. After finding the <body> tag, just below it paste the following jQuery Coding that also contains the Adsense Ad Unit. Remember: Do not forget to insert your Publisher ID as well as Ad slot ID from the following coding. All done: After customizing the Ad code according to your needs just press the "Save Template" button. Congrats you have successfully added Google Adsense Ad Between all of your Blog Posts just after read more tag. Now you are ready to earn a huge income from Google Adsense. It's your turn now to share this post along with do not forget to write your views in comment box till then Happy Earnings.